HONG KONG (CNN) -- Bowing to Chinese demands, Britain on Monday said it will allow Beijing to send 500 troops into Hong Kong three hours before British colonial rule ends next week. Meanwhile, the Royal Yacht Britannia sailed majestically into Hong Kong harbor in preparation for the territory's handover to Chinese authority. The ship, long a symbol of British interests abroad, will become the floating base for Britain's Prince Charles during Hong Kong's handover ceremonies next week. 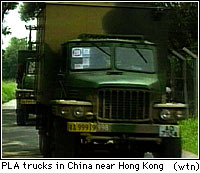 An advance group of unarmed Chinese soldiers is already in Hong Kong. London, which had resisted any additional Chinese troops before the July 1 handover was completed, yielded after protracted negotiations. "We are confident that there will be a smooth transfer of defense responsibilities between the two garrisons," a Hong Kong government spokesman said. The deployment of People's Liberation Army (PLA) troops has been a deeply contentious issue in Hong Kong, where memories of the PLA's role in crushing China's pro-democracy movement in 1989 are still fresh. The deaths at Beijing's Tiananmen Square spurred Hong Kong's own pro-democracy movement. In addition to the almost 200 unarmed PLA troops already in Hong for the handover, China had wanted to bring in more before the transfer of power to ensure security for Chinese President Jiang Zemin at handover celebrations. China's Xinhua news agency announced from Beijing that Britain had agreed that 509 troops and 39 vehicles would now enter Hong Kong on the handover evening at 9 p.m. (1300 GMT), three hours before the handover is completed. A British official confirmed the group would have rifles and sidearms, making them the first armed Chinese troops to set foot on Hong Kong soil after more than 156 years of British rule. The territory's last colonial governor, Chris Patten, says Chinese leaders are "nervous" about the possibility of political unrest after the handover. "I think Tiananmen ... made them very concerned about political control," he told CNN's Bernard Shaw. Despite new laws requiring protesters to get permission from police before they take to the streets, Hong Kong pro-democracy activists plan demonstrations just after the midnight handover. 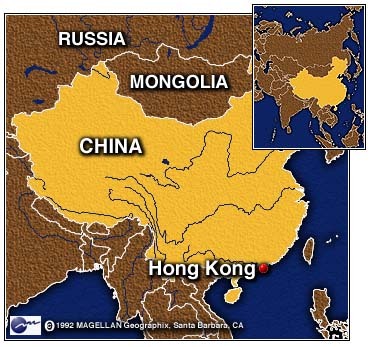 China has so far not disclosed how many troops it will eventually station in Hong Kong, but it is widely expected to be around 10,000, roughly the same size as the British garrison had been. Britannia was escorted into Hong Kong harbor by HMS Plover and two Sea King helicopters, as well as a small flotilla of boats honking their horns as it sailed past the convention center where Britain will return Hong Kong to China at midnight on June 30. A brass band played military marches on deck as the 42-year-old Britannia came in to dock in Victoria Harbor. Royal Navy sailors on board stood at attention, and dockside workmen put down their tools to watch its stately progress. The Britannia, the official private residence of Queen Elizabeth II and the royal family when they are at sea, is on its final voyage. Prince Charles will fly in later this week. He and Patten will sail to the Philippines immediately after the midnight handover ceremony, and the yacht, the oldest ocean-going vessel in the Royal Navy, will be decommissioned after its return to England. A replacement royal yacht is planned. Hong Kong Bureau Chief Mike Chinoy, Anchor Bernard Shaw and Reuters contributed to this report.